They began arriving in droves well before the start of the Kellogg’s Tour of Gymnastics Champions: A small army of giddy girls, some wearing gymnastics leotards, several so excited they couldn’t contain themselves and just had to do cartwheels and handstands outside Nationwide Arena while their moms snapped photos. I mean, come on, Simone, Gabby and Aly were all in town on Saturday night and ready to summersault, fly and layout just for all these girls, their moms, and even a few gymnastics dads. The three members of the gold-medal-winning U.S. Olympic Women’s Gymnastics team were joined by all five members of the U.S. Olympic Men’s Gymnastics Team (Danell Leyva, Alex Naddour, Sam Mikulak, Jake Dalton and Chris Brooks), as well as several former Olympians, such as Nastia Liukin, and members of the U.S. Olympic and national teams in rhythmic gymnastics, acrobatic gymnastics and trampoline teams. They sure did celebrate, and flip, twist and dance. That’s right: They danced. It turns out that Olympic-level gymnasts can also dance pretty darn well, and they performed several choreographed numbers that combined dance with gymnastics. 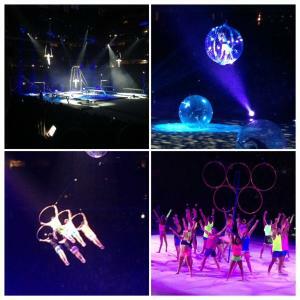 The fun, fast-paced show included a little bit of everything: Lights, lasers and music; a hip hop parallel bar routine by the male gymnasts; female athletes descending from the top on the arena in bubbles, in a net and on the Olympic rings; plenty of costume changes, including matching sets of glow-in-the-dark uniforms; a still rings performance in which the two male gymnasts were lifted 25 feet into the air and then swung around as audience members held their breath; and videos of past and present Olympic stars that helped tell the story of the growth of gymnastics in this country. A lucky audience member – a 7-year-old girl – got to learn how to do a back flip, with some help from her new best pals Simone and Gabby. In their synchronized trampoline performance, Nicole Ahsinger and Logan Dooley bounced impossible high, seemed to come to a complete stop at the apex of their leap, and then performed flips and twists in slow motion. And, of course, Simone Biles, Gabby Douglas and Aly Raisman all had their moments in the spotlight, and on the balance beam, floor and uneven bars. These three have won a combined total of 14 Olympic medals, and they gave the audience exactly what they wanted: lots of Olympic-level gymnastics, an assortment of dance moves and big smiles. All eyes were on Simone whenever she was on stage, and the reigning Olympic and World all-around champion received the night’s loudest and longest ovations. The two remaining members of perhaps the greatest women’s gymnastics team in history, Laurie Hernandez and Madison Kocian, were not in Columbus on Saturday. The grueling Kellogg’s Tour of Gymnastics Champions began on Sept. 15 in Spokane, Wash., and will visit 36 cities – for 38 shows – by the time it wraps up Nov. 13 in Boston. Not everyone performs every night, and Laurie and Madison had the night off. The upbeat, frenetic and exciting finale included the entire cast dancing, flipping and hip hopping in the center of the arena as thousands of little girls stood, screamed and vibrated with joy, as hundreds of moms took videos.